Prince Harry Astrology – Prince Harry turns 34 on 15th September 2018. 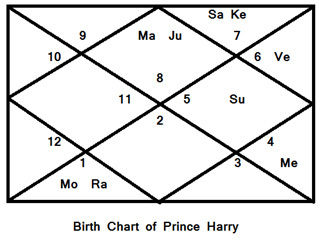 Let us see what Astrology of Prince Harry reveals about some of his prominent traits. Prince Harry: The younger son of the Prince and Princes of Wales, Charles and Late Diana was born on September 15th 1984, in London, England. In this article we will try to see through the window of Astrology what gives him leadership qualities with extra-ordinary drive and determination? Prince Harry is well known for his strong will. Prince Harry is not only a born leader but also a highly determined person. Nothing can stop him or stand in his way once he commits himself to his desired goal in life. He strongly believes in his right to freedom of choice in matters concerning his life. He is exceptionally creative and original in thought and ideas. He is not self centred and cares a lot about others. Prince Harry Astrology – Two prominent square houses viz. the 1st and the 10th occupied by their lord planets bless the native with a Royal Crown. Determination: There is a saying, “Still Waters Run Deep”. Scorpio being a Fixed as well as a Watery sign realises the truth behind this saying. Persons born under this sign have much hidden beneath the surface, so does Prince harry. The Scorpio sign loves challenges so placement of the righteous planet Jupiter in Scorpio in the ascendant gives Prince Harry moral courage to emerge a winner through difficult challenges in life. The ascendant is extra strong with its lord Mars and Mars’s friend and 5th lord Jupiter. Both these are favourable planets and give great strength to the ascendant and in turn to his personality trait of strong determination. His ascendant falls in the 1st quarter of Moola Nakshatra, this being in Aries Navamsha gives further strength to Mars. So nothing can come in his way of strong determination. Drive: It is again a very strong Mars and Leo based Sun which give him an untiring driving force. Placement of the auspicious planet Jupiter in the ascendant in the zodiac sign of Scorpio gives him moral strength to fight against any kind of injustice. Independence: The strength of the 1st and the 9th houses in his birth chart gives him the positive trait of independence. The 1st house gains strength due to being occupied by its lord Mars and the 5th lord Jupiter. Both Mars and Jupiter are friends so give strength to this house, Jupiter also aspects the 9th house which belongs to its sign of exaltation. Fearlessness: His natal Moon is posited in Aries sign and falls in the 1st quarter of Kritika Nakshatra. This part of Kritika falls in the Sagittarius Navamsha of Jupiter. This part of the Kritika Nakshatra is well known for daredevil element in the native. One becomes fearless and can excel in careers related to defence and governance. Charitable Nature: The placement of 2nd and 5th lord Jupiter in the ascendant is the main astrological indication of generosity.